Today’s infographic is simple and to the point. A big part of grade school and even college and onward, is writing papers. Some professions write more papers than others, but it is still an important skill in order to get your point across. 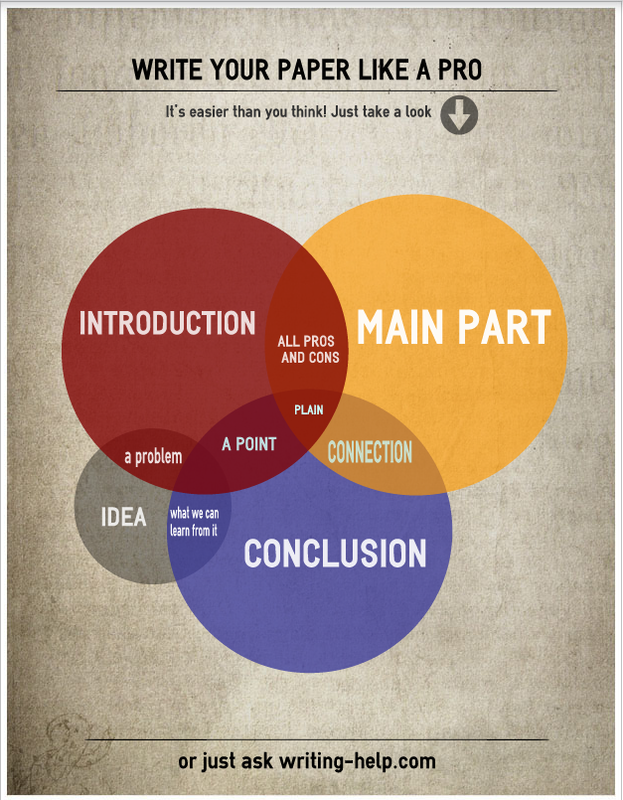 This infographic uses venn diagrams to convey the importance of different parts of papers, and to show how they interact with one another. It also shows how much of your paper should include each part. Of course every paper should begin with an introduction and end with a conclusion. It should also include several point in the middle, that are introduced and concluded in the introduction and conclusion. But how should the middle be laid out? That is up to the author, but it should there is a bit of a formula. This infographic does a great job of showing that there should be pros and cons. You should always share how your paper may be argued against, and go ahead and prove some of these points wrong. In addition, a good paper should show why the information is important. Why should someone read your paper? Show this to your students whenever a paper is assigned. Make sure your students are ready to write a good paper, and know what is involved in writing such a paper. African American parents are increasingly taking their kids’ education into their own hands—and in many cases, it’s to protect them from institutional racism and stereotyping. Marvell Robinson was in kindergarten when a classmate reportedly poured an anthill on him at the playground. After that, the gibes reportedly became sharper: “Why are you that color?” one boy taunted at the swing set, leaving Marvell scared and speechless. The slow build of racial bullying would push his mother, Vanessa Robinson, to pull him from his public school and homeschool him instead. And while white homeschooling families traditionally cite religious or moral disagreements with public schools in their decision to pull them out of traditional classroom settings, studies indicate black families are more likely to cite the culture of low expectations for African American students or dissatisfaction with how their children—especially boys—are treated in schools. Marvell, now 7 and in the second grade, was the only black student in both his kindergarten and first-grade classes, and one of only a few black students in his San Diego elementary school, according to his mother. And Marvell’s Asperger syndrome—a high-functioning form of autism that makes social interaction difficult—only added to the curiosity and cruelty with which his fellow classmates approached him, Robinson added. She was concerned the school wasn’t doing enough about it. “I just thought maybe I could do a better job myself,” she said. “They said, ‘kids will be kids,’ and the only solution was for Marvell to be monitored—like he had done something wrong,” Robinson said. “In the end, I don’t think that anyone should have to monitor my kid” because of other kids’ behavior. Robinson allowed Marvell to finish first grade there and began homeschooling him when he started second grade in September. Robinson adjusted her nursing schedule to include 12-hour shifts on the weekends so she could take on educating Marvell during the week. Her husband, a sous chef at a restaurant in downtown San Diego, continues to work full-time and participates in lessons when he can. Robinson likely joins hundreds of other African American parents who’ve decided to homeschool their children because of dissatisfaction with the traditional campuses. Indeed, Joyce Burges at National Black Home Educators has watched her membership grow “exponentially” in the 15 years since the organization was founded, a trend also reflected in Marvell’s home state of California. While Burges’s national conferences in Baton Rouge, Louisiana, used to attract only around 50 people, they now attract upwards of 400, she said—a noteworthy number for the first organization for black homeschoolers in a sea of predominantly white organizations. Research conducted by Marie-Josée Cérol—known professionally as Ama Mazama—also offers insight into the growing trend. A faculty member in the African American Studies department at Temple University in Philadelphia, Mazama began homeschooling her three children 12 years ago and realized quickly that there was little research on black homeschoolers. Mazama said schools also rob black children of the opportunity to learn about their own culture because of a “Euro-centric” world-history curriculum. “Typically, the curriculum begins African American history with slavery and ends it with the Civil Rights Movement,” she said. “You have to listen to yourself simply being talked about as a descendent of slaves, which is not empowering. There is more to African history than that.” Mazama’s studies show that black parents who choose to homeschool often teach a comprehensive view of African history by incorporating more detailed descriptions of ancient African civilizations and accounts of successful African people throughout history. This allows children to “build their sense of racial pride and self esteem,” she said. It’s assumed that African Americans homeschool for the same reasons European Americans do, but this is seldom the case. However, both Mazama and Fields-Smith say this is beginning to change; barriers that in the past might have left homeschooling out of the question for many working-class families are being lifted. Greater access to public-education resources is making homeschooling more appealing, too. Mazama pointed to the availability of subsidies ensuring homeschooled children have access to standard public-school nutritional offerings, for example, and public programs allowing homeschooled students to enroll in extracurricular activities and after-school sports as reasons why families are increasingly seeing homeschooling as a valid alternative to traditional education. In fact, Fields-Smith is in the process of writing a book on black, single homeschooling mothers because she sees “more and more families of less means” making the decision to sacrifice traditional career paths so that they can pull their children from school. Rhonda McKnight would be an archetypical candidate for Fields-Smith’s book. As a single mother, she works about 45 hours per week as a contractor for the state of Georgia—often at odd hours and during the weekend—so she can homeschool her 8-year-old son, Micah. “It’s not easy,” McKnight said. “It’s extremely difficult to balance everything.” While a common criticism of homeschooling is a potential lack of socialization for children, Mazama said the growing number of homeschooling groups solves this problem. McKnight for her part joined a homeschooling collective that, in addition to providing Micah time with other children, also helps her manage her workload. The group gathers on Tuesdays, Wednesdays, and Thursdays to engage in extracurricular and hands-on learning activities that can’t easily be done in the home, giving McKnight some time to herself—and, of course, some time to work. To get Micah up to par in his academics, McKnight has employed a customized mix of purchased homeschool lesson plans and learning materials she developed herself—all on top of what he learns at the collective. When Micah is home, McKnight said her days are “totally dedicated to him.” They work for at least an hour on each of the core subjects, studying within the grade level that best suits him in each area. On days he returns from the collective, McKnight reads with him for two or three hours with the goal of getting him to a third-grade level by the end of the year. Lessons even continue on Saturdays and Sundays. He’s at his father’s place every other weekend, where he continues his reading schedule, and on the weekends that he’s home McKnight takes him on educational field trips—Atlanta’s many museums are frequent destinations. It’s this ability to shape everyday activities and lessons to meet the personal needs of each child that Fields-Smith finds so promising about homeschooling—especially for black families. “There is no one way to homeschool,” she said, noting all of the families that she consulted for her study were “catering to their children and customizing their education for them” instead of using a single stock homeschooling curriculum. In 2003, Penn-Nabrit published a book, Morning by Morning: How We Home-Schooled Our African-American Sons to the Ivy League, in an effort to help others repeat her successes with homeschooling. Her older twin sons, Damon and Charles, both attended Princeton, and her youngest son, Evan, went to Amherst College and then to the University of Pennsylvania. * The book, according to Penn-Nabrit, received “a lot of open hostility”—with several people accusing her of racism—because it detailed accounts of the discrimination her sons allegedly faced in public school and emphasized an Afrocentric approach to education. Upon deciding to homeschool their sons, Penn-Nabrit and her husband, both of whom have degrees in the humanities, elected to teach them the subject areas they knew well. ** For the remaining science and math courses, however, they hired black, mostly male, graduate students from the Ohio State University to take over—in large part so that the boys had exposure to successful people who looked like them. *** After all, according to the Department of Education, less than 2 percent of current classroom teachers nationwide are African American males; until their homeschooling, Penn-Nabrit’s children had never had a black man as a teacher. Back in San Diego, Vanessa Robinson has also seen it work. Now that she’s been homeschooling Marvell for five months, she notices that he is better adjusted and has moved farther along academically than he did in public school. “He’s a completely different person,” she said, reporting that his confidence is higher compared to where it was in public school, allowing him to make friends in his neighborhood and learn more quickly. Robinson said that, while she bought a set of lesson plans with a suggested timeline, Marvell now moves so quickly that she has to add lessons together from an array of instructional programs just to keep up. And when he finds something he loves, she lets him dive deep. “Right now, Marvell says he wants to work for NASA, so we’re really focusing on getting in depth into science and space,” she said. His new interest is a thrilling prospect for Robinson, a registered nurse with a background in science. * This post previously stated that both of Paula Penn-Nabrit’s sons graduated from Princeton with honors. We regret the error. ** This post previously stated that Penn-Nabrit’s husband had an advanced degree in the humanities. We regret the error. *** This post previously stated that the graduate students Penn-Nabrit hired to instruct her sons attended the University of Ohio. We regret the error. Excerpt from Thinking Through Project-Based Learning: Guiding Deeper Inquiry, published by Corwin, 2013. When students engage in quality projects, they develop knowledge, skills, and dispositions that serve them in the moment and in the long term. Unfortunately, not all projects live up to their potential. Sometimes the problem lies in the design process. It’s easy to jump directly into planning the activities students will engage in without addressing important elements that will affect the overall quality of the project. With more intentional planning, we can design projects that get at the universal themes that have explicit value to our students and to others. We can design projects to be rigorous, so students’ actions mirror the efforts of accomplished adults. They will feel the burn as they learn and build up their fitness for learning challenges to come. There are several ways to start designing projects. One is to select among learning objectives described in the curriculum and textbooks that guide your teaching and to plan learning experiences based on these. Another is to “back in” to the standards, starting with a compelling idea and then mapping it to objectives to ensure there is a fit with what students are expected to learn. The second method can be more generative, as any overarching and enduring concept is likely to support underlying objectives in the core subject matter and in associated disciplines, too. Either way you begin, the first step is to identify a project-worthy idea. We have condensed the project design process into six steps. After outlining the steps briefly below, we offer examples that show how one might use these steps to develop a germ of an idea into a project plan that emphasizes inquiry. Read the steps and examples all the way through before digging in to your own plan. Ask yourself: What important and enduring concepts are fundamental to the subjects I teach? Identify four or five BIG concepts for each subject. Now, think: Why do these topics or concepts matter? What should students remember about this topic in 5 years? For a lifetime? Think beyond school and ask: In what ways are they important and enduring? What is their relevance in different people’s lives? In different parts of the world? Explore each concept, rejecting and adding ideas until you arrive at a short list of meaningful topics. Look back to three or four concepts you explored and think about real-life contexts. Who engages in these topics? Who are the people for whom these topics are central to their work? See if you can list five to seven professions for each concept. With that done, now think: What are the interdisciplinary connections? In what ways might the topic extend beyond my subject matter? For example, if your subject specialty was math and you imagined an entrepreneur taking a product to market, the central work might involve investment, expense, and profit analyses. The project might also involve supply chains and transportation (geography), writing a prospectus for a venture capitalist (language arts), and designing a marketing campaign (language arts, graphic design, technology). Now, step back and write a project sketch—or two or three. For each, give an overview of the project. Describe the scenario and the activities students are likely to engage in. Anyone reading it should be able to tell what students will learn by doing the project. The process of writing will help you refine your ideas. There are dozens of project sketches in this book (and all are included in the Project Library in the Appendix). Use them as a guide. Three small but useful elements are left, and together with the project sketch, they provide a framework for the project. Write a title, entry event, and driving question for your project. Project title. A good title goes a long way toward anchoring the project in the minds of your school community. A short and memorable title is best. Teachers at Birkdale School in New Zealand take their projects seriously. They not only provide them with proper names but also fly a special flag in the school’s entry when a new project begins. You might not need to go this far, but a good title conveys a sense of importance and helps make a project memorable. Let these project titles inspire you. AD 1095 and All That—Time-traveling students intervene to stop religious wars in medieval Europe. Risk and Reward—Students acting as financial counselors present stock information to clients and advise on investments. Stay or Leave?—Students examine economic factors that influence people’s decisions about where they live. YouVille—Students explore past civilizations to design their own utopias. Entry event. Plan to start off the project with a “grabber,” a mysterious letter, jarring “news,” a provocative video, or other attention-getting event. As we discussed in Chapter 4, make sure it is novel (to make students alert) and has emotional significance (to make them care). Read these examples and imagine how your students might respond. Then plan an entry event for your project. A newspaper article describes hazards associated with a clinic’s use of poorly refurbished X-ray machines. Distraught warrior king Gilgamesh appears in class and appeals to his “subjects” to help him learn why an enemy’s technological prowess in battle outstrips his own. A process server slaps student “witnesses” with subpoenas, compelling them to testify in an upcoming trial. A letter from an elder describes her desire to capture stories before she and other storytellers are no more. A television news story on “designer” babies kicks off an investigation about the ethical implications of genetic manipulation. A forest owlet from a wildlife rescue center visits school bringing Owl Mail and asks students to investigate hazards to its survival. Driving question. Kick off your project with a research question students will feel compelled to investigate. Imagine a driving question that leads to more questions, which, in their answering, contribute to greater understanding. Good questions grab student interest (they are provocative, intriguing, or urgent), are open ended (you can’t Google your way to an answer), and connect to key learning goals. What are archetypes in literature? à To increase relevance, you might ask à How do archetypes inform our culture today? What causes tornadoes? à To add context, you might ask à How can we prepare for a natural disaster in our region? What are the requirements to sustain life? à To add interest, you might ask àHow can we design a biome that is self-sustaining? How can we purify water? à To increase challenge, you might ask à How can we advise a village in the developing world to choose an inexpensive water purification system? Workshop your project idea, especially at steps 5 and 6. Colleagues, students, parents, and subject matter experts will ask questions that will clarify your thinking and contribute ideas you might not have considered. For more about the book, check out Suzie Boss’s ISTE presentation. Should Schools Implement Social Media Policies? Facebook wasn’t a topic of conversation in high schools 10 years ago — it hadn’t even been invented yet. One decade and a billion users later, and with the introduction of Twitter, Instagram and other social networking platforms, it’s become an unavoidable cultural commodity. If you’re a teacher, your students most likely have profiles, and vice versa. There are plenty of examples of Facebooking-gone-wrong in the education field so far. There’s the teacher in Pittsburgh, Pa., whose colleagues discovered her photo with a stripper online, and the Boston-area teen who was arrested for alleged “terrorist threats” in a rap video he posted to Facebook. But the logistics of what is and isn’t acceptable between students and teachers online are still being figured out — and it largely varies by school. Mashable reached out to a few schools across the U.S. to ask about how they’ve adjusted to the digital era. Our primary question: Should there be an overall policy for social media use? Hans Mundahl is the director of technology and integration at the New Hampton School, a private boarding high school in New Hampton, N.H. The school is a “one-to-one iPad” institution, meaning every student and teacher is provided with a tablet. The second policy has to do with Facebook groups. Mundahl said it’s common for the school to create groups for their sports teams and update them with photos, game schedules and rosters. The final policy is about respecting students’ personal social media presences. In other words: No online “sting” operations. “We do [conduct] some passive monitoring for our school’s name using TweetDeck. Usually, the results are about the new Hampton Inn hotel or something else unrelated,” Mundahl says. “But sometimes we’ll find a student, whose profile is public, who’s raising a bit of a red flag with their posts or tweets. We’ll normally update the student’s adviser, and sometimes send the student an email saying, ‘Hey, by the way, we came across this post where you weren’t representing yourself or the school well — just want to let you know.’ But no punishments are issued,” he says. Other schools have looser regulations regarding student-teacher relationships online. Robert Dill, who teaches government, psychology and sociology at the public Forest Hills High School in Sidman, Pa., says it’s not uncommon for students and teachers to be connected on social media. “We don’t have a ‘policy’ in place, necessarily, but it’s definitely an evolving process,” he says. “Initially, when Facebook and everything started exploding, the school district frowned on teachers using it, fearing there would be a miscommunication or improper use with students. Dill’s not one of them — instead, he interacts with students on Twitter. If someone has a question about an assignment due date, or needs clarification on a subject matter, they’ll tweet at Dill. He’ll respond, usually through email. Dill follows his students back on Twitter, and occasionally comes across some not-so-great-for-a-teacher-to-see tweets. But, similar to Mundahl, he said he’s not out to play detective on anyone. A rule that should also apply to teachers, he adds. The logistics of what is and isn’t acceptable between students and teachers online are still being figured out — and it largely varies by school. New York-based business attorney Pedram Tabibi believes social media policies are integral for both businesses and schools to implement — so long as they’re tailored to each individual institution. But there are right and wrong ways of doing so. A handful of employers, he says, have asked their employees and job applicants for their social media passwords: Facebook, Twitter, Instagram — the whole nine yards. Ten states have outlawed the practice, and the SNOPA bill (Social Networking Online Protection Act), introduced in April, is being pushed at the federal level to make asking employees for their social media passwords illegal in every state. Does your school have a social media policy? If not, do you believe there should be one in place? Or is it unnecessary? Share your thoughts with us in the comments. Jeff Piontek commentary about the article, there needs to be a social media policy for our students and to protect them from the “dark side” of the web. 10 Twitter Mistakes People Make…. 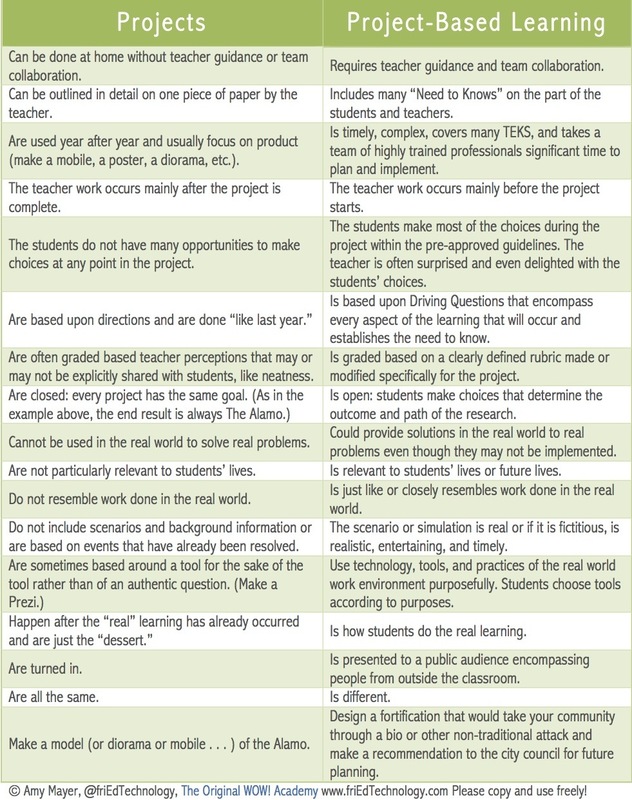 There’s a big difference between using projects in the classroom versus project-based learning in the classroom. What are those differences, you ask? Lucky for you, friEdTechnology (great name) whipped up this snazzy side-by-side comparison outlining the biggest differences. On the flip side, Project-Based Learning is a fluid technique to enhance learning that really looks nothing like projects as they’re described below. For example, in a PBL scenario, the teacher’s work is typically done prior to the start of the project, it’s graded on a clearly defined rubric, and has driving questions that keep the learning going. As you can see, this is quite a slanted look at how projects are different from project-based learning but it’s interesting nonetheless. What do you think of this chart? Is it accurate? Are the descriptions correct? What would you change? Jeff Piontek commentary on this is that either way these are engaging ways to get our students to look at school/classes in a very different manner. Results from a new survey presented during ISTE 2013 indicate that U.S. schools and universities still strive to expand their technology use, and postsecondary institutions often lead the way in technology integration. On June 26, the Software & Information Industry Association (SIIA) released the full report from its 2013 Vision K-20 Survey, the sixth annual national survey to measure U.S. educational institutions’ self-reported progress toward building a framework that embraces ed-tech and eLearning. For the first time, the 2013 survey asks about “bring your own device” (BYOD) policies in the classroom. The responses varied by education level, with only 20 percent of the elementary segment currently allowing devices in the classroom compared to close to half of the secondary and K-12 district segments. However, this gap may narrow in the next five years if participant expectations are accurate. A majority of K-12 and close to half of postsecondary participants who report devices are allowed in the classroom also mention that their institutions currently restrict their use. At the K-12 level, restrictions on use can be expected to stay the norm in the near (five-year) future. However, at the postsecondary level, responses indicate two different paths for BYOD: people at institutions that currently allow devices but restrict their use anticipate restrictions are likely to continue in the future, while those who report BYOD with no current restrictions anticipate no restrictions in the future. Among institutions that currently allow BYOD, more than three-quarters of K-12 educators report current restrictions on their use in the classroom. Among respondents at institutions which currently allow BYOD or expect their institution will allow BYOD within the next five years, a majority anticipate future restrictions on use, although a notable proportion in each segment say they don’t know. Levels of ed-tech integration at schools are holding steady despite budget challenges, while interest in ed-tech integration continues to remain high. Schools and universities continue to rate the importance of ed-tech integration as very important. Postsecondary continues to lead the way in ed-tech integration compared to K-12. The final 2013 report is available here. The 2013 Vision K-20 Survey was developed to provide benchmarks against which educators and administrators can measure their institutional progress in using technology to provide 21st century tools, anytime/anywhere access, differentiated learning, assessment tools, and enterprise support. “Jeff Piontek” as an administrator and as a teacher this is interesting. Being the former Director of Instructional and Informational Technology I have implemented a 1:1 program and it is daunting. This is the way of our students in our schools today. Teacher certification requirements vary greatly from state to state. Most states have various levels of certification for teachers based on the age group or subject area they wish to teach. Please see our state-by-state breakdown to determine the specific requirements needed to get certified in your state. This is pretty amazing as a teacher (Jeff Piontek) I remember going through the process and it was daunting.